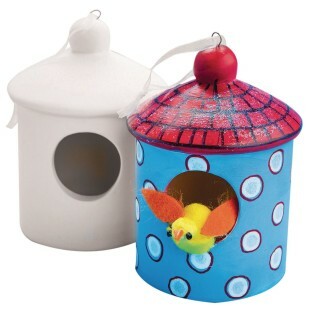 Create a sweet little birdhouse complete with ribbon for hanging! We recommend acrylic paint or permanent markers for decorating. If hanging outdoors, item should be sealed with appropriate sealant (we recommend PT3461). All supplies sold separately. Item measures 2-3/8” x 4-1/4” plus ribbon for hanging. The kids loved painting this birdhouse! We supplied the bisque birdhouses trinket boxes and mason jar vases at our church's annual craft workshop. This activity was popular. We provided acrylic paints and paintbrushes minimal supervision was needed. This is a great activity without a lot of preparation. Just give out the supplies and let them paint! We usually use a variety of the SSWW bisque items every year. They are good quality and value and the crafters enjoy them. We rarely have problems with breakage and have never had one broken in shipping -- well packed.